The Ultrovent Pro is the latest addition to the Ultrovent range of passive ventilation units. Ultrovent Pro diffuses an impressive 1 litre of water vapour/day. The Ultrovent range is the ultimate in controlled passive ventilation. 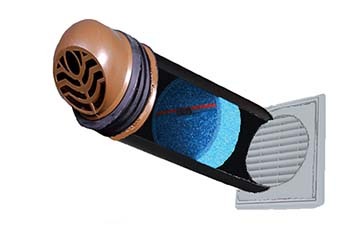 The unique triple action filter reduces condensation, noise transmission and heat loss. At the heart of the Ultrovent is a thermal core that promotes the movement of damp air out of the property. Ultrovents are also available as air bricks and 127mm core drill units including for high rise installations.